Soak black glutinous rice and red bean with cold water overnight after washing. This will soften them and makes it easier to cook. Fill a container with rice and red bean. Top up with water just to cover. Tie pandan leaves into a knot and immerse into them. Steam for about 60 to 90 minutes, stirring every now and then to ensure even cooking. Rice and beans which weren’t soaked overnight will require a much longer time to cook. Rice and red bean could be cooked in a pot on the stove, but they have a tendency to stick. So, the chances of burning them are quite high if not stirred constantly. Rice kernel should not be al dente, it should be soft and gooey when done. Water could be added if it became too thick. Or if the cooked mixture is too runny, it could be drained with a sieve. Soak sago in cold water for about half an hour. Cook in pot separately for about 10 to 20 minutes. This could be left al dente with a tiny fleck of white in the middle. Drain using a sieve. Mix well with cooked rice and red bean while everything is still hot. Remove pandan leaves. Add sugar to cooked mixture, stirring well to mix. Keep adding in batches until you achieve the sweetness you are comfortable with. Sugar must never be added prematurely as that will be stop the rice and bean from bursting and mixture will not be gooey. Leave to cool before refrigerating. Add salt to coconut cream. It is best to use only the top creamy part of the tin so that mixture is not too watery. Mixture could be left in fridge overnight to thicken if desired. Scoop cold rice, bean and sago mixture into a bowl or glass container. Top up with salted coconut cream, as desired. 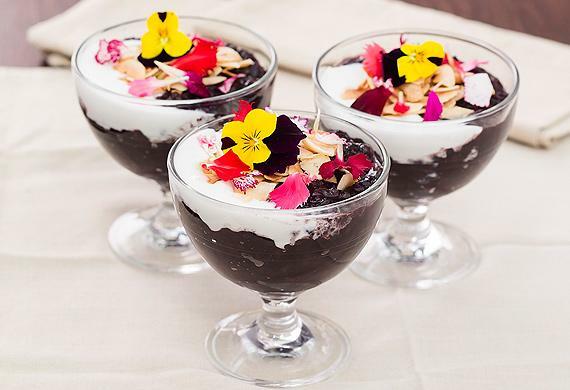 Sprinkle with coconut crisps and decorated with flowers prior to serving. Dessert could be served hot.